As more and more people rediscover, or in many cases discover for the first time, how much better homemade bread is than industrially made sliced white bread, bread maker manufacturers seem to be in a race to pack more features into their machines to grab a bigger slice of this growing market. One manufacturer who has just about managed to pack more than most in to their bread maker is Breville with their BBM800XL model (see today's price). It has 13 program setting and then on many of the selections you can choose a choice of 3 crust finishes and a choice of 4 sizes of loaf from 1 lb. up to 2 ½ lbs. Fruit and nut additions to your loaf are added automatically at the optimum time. One of the issues with bread made in a bread maker is the fact that you either have to stop the process and physically remove the mixing paddle before the bread bakes or take it out later, after it has been baked into the loaf. The Breville BBM800XL overcomes this issue to some extent with their collapsing paddle which, although does leave an indentation in the base does not leave a hole where the paddle has been extracted. Breville claim that their collapsing paddle is unique, perhaps they are unaware of Bradman’s collapsing paddle which operates in a similar way. One little feature for which Breville do get credit for is being able to mute the audible warning sound. Most of the time it is not needed and can become an irritant. In addition the Breville BBM800XL has many features that a pretty well standard on most modern bread makers. A delay setting that allows you to set a time up 13 hours in advance of when you want your bread ready. It will automatically switchover to a keep warm setting for up to 60 minutes when the baking cycle has finished. The Breville BBM800XL is a bread maker with the capacity to bake a loaf of up to 2 ½ lbs. so it should be expected to be quite large. Actually it is quite comparable, size wise, with several bread makers with a smaller capacity. Overall it measures 9.6 inches x 16.4 inches x 13.3 inches, without any ingredients in it, it weighs 16.8 lbs. 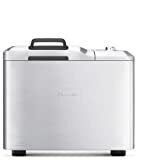 Externally the Breville BBM800XL is finished in an easy clean brushed stainless steel. While there are several bread makers available that will make 3 different sizes of loaf, it is unusual to find one that will make 4 different sizes, ranging from 1 lb. through to 2 ½ lbs. in ½ lb. increments. These can all be made in either 1 lb., 1 ½ lb., 2 lb. or 2 ½ lb. loaf with a choice of light, medium or dark crusts. Gluten Free – for use when using flours that do not contain gluten. Because of the way that this bread is made it is only possible to make either a 2 lb. or 2 ½ lb. loaf but still with a choice of the three different crust finishes. Crusty Loaf – this setting is for breads that have less fat or sugar in them. The bread takes longer to make but the resulting crust is crisper. The various crust settings cannot be selected in this program but all the size options can be chosen. Sweet – this is the opposite of the crusty loaf in that the bread is high in fat and sugar. It is baked at a lower temperature to ensure that the loaf is not too dark. While the crust options cannot be used, the Breville BBM800XL can make bread in any of the 4 size options. Yeast Free – this is bread made using a rising agent such as baking soda instead of yeast. Both the size and the type of crust is governed by the recipe so there are no options on this program. Dough – there are 3 dough options available, bread dough, pizza dough and pasta dough. The main differences between the settings is whether the dough need to rise or not. Bake Only – this setting can be used for baking pre-made dough or heating or darkening the crust of an already baked loaf. Jam – bread makers are ideal for making jams as the temperature can be correctly controlled and the jam can be constantly automatically stirred as it cooks. For this setting a fixed, rather than collapsible, mixing paddle is used. With all these setting it would seem that it could be difficult to set the correct program, but it is quite straightforward. A the bread is selected, the screen then moves on to any options that are available with that program and then moves to the next selection. One of the problems with bread makers is that 2 people can have the same machine and have totally opposing opinions on it. Most of the problems seem to be in the quality of the bread made. Manufactures say that it is highly important that the measure are accurate then give solid ingredient measure in cups and not weights. Breville does have a conversion early on in their manual but then all the recipes are in cups. A ½ cup of butter? Nobody could deny that the Breville BBM800XL is packed with features and that it is a highly versatile bread maker. Breville have made a good job of managing to add all these features without making the controls too complicated. The only area of doubt on the machine is the collapsing mixing paddle. Breadman have had many problems with theirs scraping the base of the tin and scratching off the non-stick coating. Reading through some customer reviews it seems as if the Breville BBM800XL occasionally has a similar problem although, as yet, it does not appear to be on anywhere near the same scale as the Breadman machine. It is still relatively early days for the Breville BBM800XL but it seems to be well like by the majority of its users.